As some of you probably guessed, I initially planned to conclude this series with last week�s post: in terms of �pure� puzzlers, everything I have to teach is already before you. As the finishing touches were being applied to Ochige 401, though, somehow I was not yet satisfied - most of my students had long since dropped out, but still more remained to be done. True completion of my overall task would involve field research from beyond the genre�s frontiers, but there was simply no putting it off. Should any of you wish to accompany me once more, beyond �Magnet School�s minimum requirements, consider this final class on the near-extinct Single-Screen Puzzle-Platformer your Extra Credit. 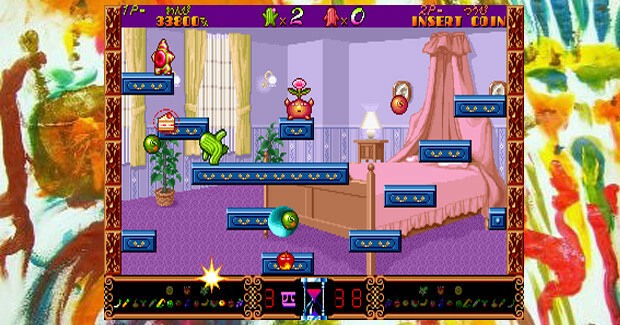 In ages past, Bubble Bobble (whose protagonists you might recognize from a later, more popular puzzler), Snow Bros., and their brethren were popular mainstays both in arcades and on home consoles. The world was simpler then, divided into hard-and-fast segments no more than a few hundred pixels in diameter; multiple buttons were rare, while bonus point items were plentiful. This intriguing sub-species has since all but completely vanished from the modern gaming landscape, and the samplings set aside for you here are largely unknown even to specialists in the field � these comprise the most obscure of obscurities, the oddest of oddities, and, I hope, the most eye-opening of lessons. What Is It? � Hey, it�s our old pal Data East again! (That sound you hear in the distance is megaStryke fleeing for the hills.) 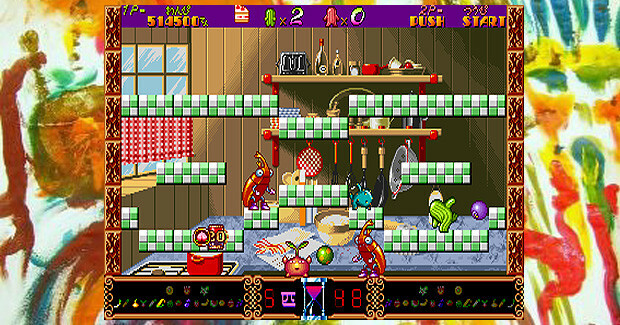 From 1991 through 1994, the company released a trio of loosely-related single-screen puzzle platformers: all three share certain play mechanics (and some recycled assets), but their themes could not be more different. The genesis of this pseudo-trilogy is the oft-bootlegged Tumble Pop, while the role of �baby brother� is filled by the grammatically-questionable Joe and Mac Returns; Diet Go Go, the �middle child� from 1992, is easily the least-known, and my personal favorite. Just to be safe, I should caution you not to confuse this game with the rather lousy Flash distraction Go Go Diet. How Does It Work? � If you�ve never played this type of game before, rest easy knowing that they don�t take long to learn: Diet is certainly no exception. 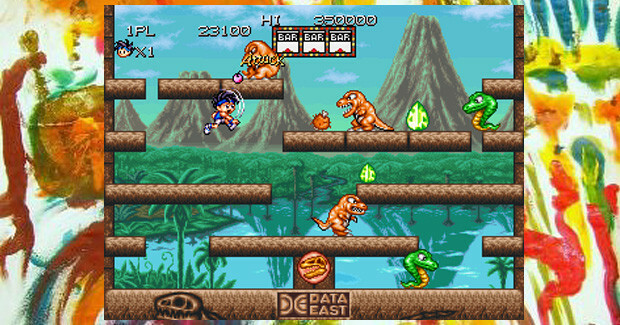 You�ve got one enclosed screen to run around in per stage, and your primary goal is to defeat all the enemies in each area: the only actions you need to worry about are �run� (joystick), �jump� (button A), and �throw� (button B). 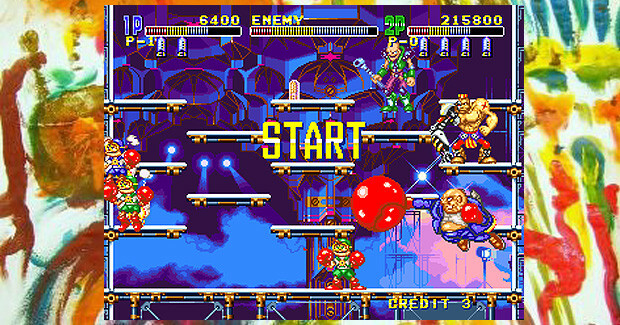 Hit any enemy two or three times with your unlimited arsenal of short-range projectiles (which can only be tossed straight left or right) to inflate him like a balloon: at this point it�s safe to walk or jump into him to send him sliding or careening around the stage, taking out any fellow baddies he hits before finally popping out of the picture. The more destruction a single �blown-up� enemy causes, the higher your point tally, and the more valuable the item drops left in its wake. Pardon the �Let�s Play� commentary in the video: if there�s another decent vid of Diet Go Go out there, I�ve yet to find it. Speaking of items, alongside a wide variety of score-boosters you�ll find standard-issue speed-ups, power-ups, and temporary shields. 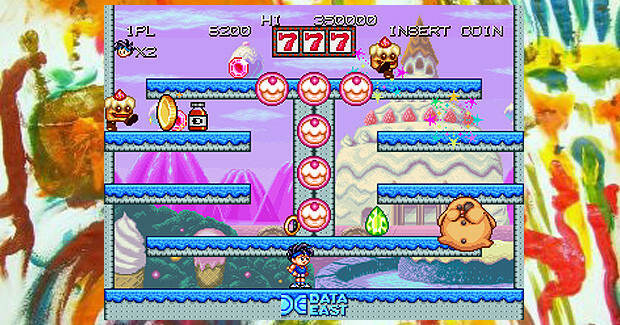 To spice things up some be sure to grab certain oversized coins (bearing the Data East logo) to power a slot reel at the top of the screen: a lucky spin will shower the level with bonus pickups. Don�t get careless as you run around trying to collect everything, though: you can only attack one enemy at a time, so tight groups of nasties can and will bulldoze over-aggressive players. Moreover, how inflated an enemy is determines the angle at which it bounces, so simply wailing on the attack button isn�t always your best option. Every few levels you�ll encounter a not-so-terrifying boss, which must be defeated by bouncing a handful of underlings into his weak point � environmental hazards such as spikes and buzz-saws show up from time to time too, so look sharp. You might assume that the bizarre �diet� theme of the title only applies to the presentation, but it actually goes a bit deeper than that (though not TOO much deeper). As in most single-screen puzzle platformers, if you directly touch an enemy or obstacle, you die in one hit: baddies here can also throw bits of food at you, but interestingly, if you�re hit by these flying edibles instead of the critter itself, you don�t conk out. Instead, you�ll just get fatter and slower (apparently your characters are unable to resist ingesting random stuff in midair). If you can find and grab a �Diet Drink� item you�ll revert to your normal svelte self (if only it was that easy, huh? ), but if a second delectable enemy projectile hits home while you�re still in �chubby mode� the extra pounds will drag you right off the screen and cost you a life in exceedingly embarrassing fashion. Oddly enough, nothing else you pick up increases your weight at all � strange how carting around massive amounts of rings and gemstones has no ill effect whatsoever, but one measly cookie is enough to put you in Carnie Wilson territory. Then again, judging from personal experience that�s pretty much how it works in real life. Why Should I Play It? � By far my favorite thing about Diet Go Go is its devil-may-care brand of sugar-rush insanity, a deep-fried, politically-incorrect guilty pleasure if ever there was one: while I certainly don�t miss everything about the so-called �golden age� of gaming, I can�t help but wax nostalgic about a time when making a lick of sense was not only optional, but discouraged. Diet�s �plot� concerns a mad scientist who decides to use highly-advanced futuristic technology (i.e. throwing food at people) to make the entire world morbidly obese; it�s up to a pair of kids in workout clothes to raise the hallowed banner of non-corpulence. After letting loose a blood-curdling battle cry of �Let�s Diet!�, armies of mutant gingerbread men, walking gumball machines, cyclopean garlic monsters, French-fry sea anemones, (presumably) evil mustachioed chefs and (undoubtedly) evil clowns will be trampled, one and all, beneath your sweaty tennis shoes of justice. A fever-dream concept of this magnitude, complete with seizure-inducing rainbow sunbursts a-plenty, wouldn�t have a snowball�s chance of publisher approval today: God bless you, Data East, for seeing to it that this essential overdose of abject lunacy was unleashed upon the world while there was still time. But yeah, I suppose I ought to actually talk about the gameplay too. 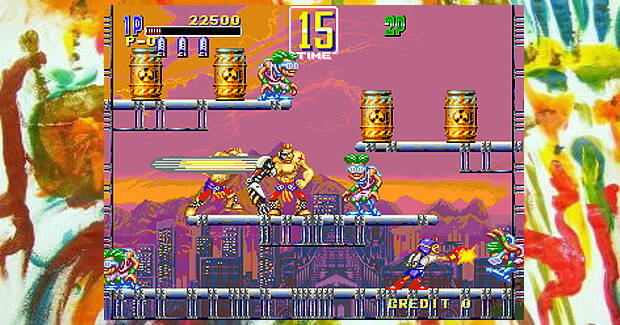 One constant and very welcome feature carried over from Tumble Pop is the player�s ability to jump straight down through platforms � it sounds like a very basic thing, but you wouldn�t believe how many similar titles don�t allow for this degree of mobility, and how liberating it is to have here. Taking things a step further, perhaps the biggest single improvement that Diet makes over its elder sibling is increasing your character�s default movement speed � while it was previously too easy for enemies to sneak up and steal a life if you hadn�t found a �speed up�, here your little fitness maven jogs about at a good strong pace (as long as he or she hasn�t been fattened up, at least). A second wisely-implemented tweak allows you more time to gather leftover items after completing a stage before being swept off to the next one � a bit of bad luck can still result in a few trinkets being left behind occasionally, but Diet is still a definite step up in this department. In a nutshell, here you have one of the relatively few �action-puzzlers� which doesn�t feel like the developers skimped on making the �action� part smooth and enjoyable - now if only someone, somewhere, could do the same for action-RPGs. Seriously, get on that. Where Can I Find It? � I wonder if future game writers will eventually uncover proof that Data East somehow ticked off an old Gypsy woman: at times it feels like an ancient curse must be preventing the company�s best games from ever reaching the audience they deserve. While Diet, unlike Ghostlop, actually made it into arcades, that�s as far as it ever went; chances are, if you want to play this one nowadays, you�re gonna have to emulate it. Even more worrisome is the fact that both Tumble Pop and Joe and Mac Returns are included in G-Mode�s list of secured Data East properties, but Diet Go Go is not � did they somehow overlook it, or is the subject matter just so unpalatable nowadays that they didn�t even bother? Either way, it�s a crying shame. Anything Else? � The lazy, obnoxious answer to this query is �play Tumble Pop and Joe and Mac Returns (not to mention the former�s bevy of clones, if you dare) and leave me alone!� In the interest of not being a total jerk, however, I�ll also direct you towards Qwak � there aren�t any inflating-and-bouncing shenanigans to be found here, but the sheer amount of fruit-related chaos taking place onscreen most of the time certainly recalls the spirit of Diet Go Go, if nothing else. Homebrew offering Bisketan Poi has some of that same food-obsessed mojo going as well. What Is It? � Of all the low-profile developers I�ve researched for �Magnet School, I had perhaps the toughest time getting a bead on NMK: they�re semi-notorious among well-traveled shmuppers for a handful of off-kilter shooter releases, but digging up further details is like hunting jackalope. 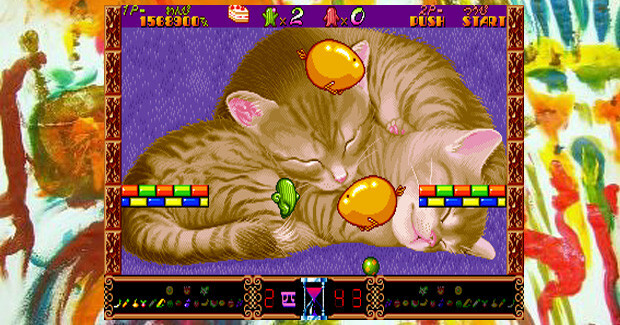 I do know that the company frequently teamed up with several large publishers of the day, most notably Banpresto, (pre-Guilty Gear) Sammy, and (pre-plastic surgery) Tecmo, which shepherded this exceedingly strange offering to market in 1992. Oh, and otaku readers, one last time: any part of the title look familiar? Anyone who knows their Final Fantasy might recall semi-iconic monster �Sabotender�, better known to most of us as �Cactuar�, the annoying little cactus dudes. 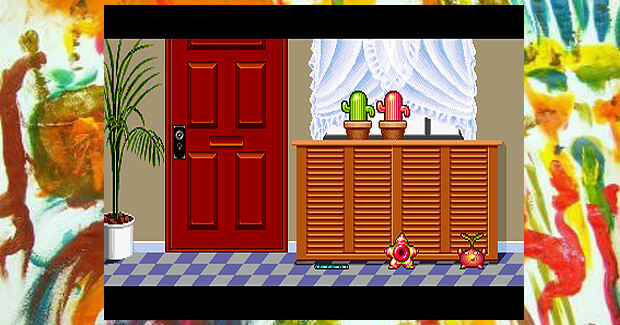 In this game, however, the cacti are the heroes�and they�re packing more than just needles. How Does It Work? 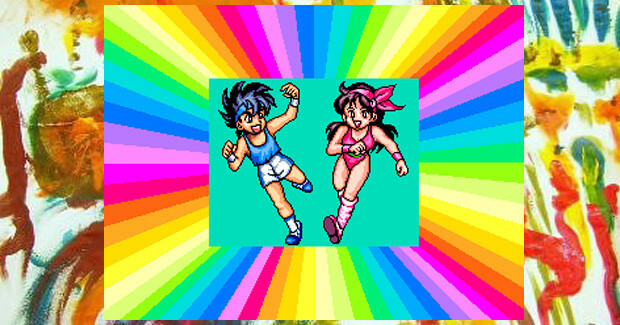 � As in Go Go Diet, all your spiky green protagonist can do is run, jump, and throw, though the latter mechanic is a bit more involved (and dangerous) here. Your primary �sideways� attack flings a fast-moving, bouncy, and (most importantly) explosive projectile which will �capture� most enemies it touches before blowing up � the more bad guys you can dispatch with one bomb, the better your rewards (just beware of certain booby-trapped �power-down� items). If you�d prefer to play cat-and-mouse with your prey, hold �down� on the joystick and press �throw� to set a bomb on the spot, a handy trap for anybody foolhardy enough to wander by. Be warned, when I say �anybody�, I mean ANYbody, including you � yup, in this game careless players can end up toasted by their own ill-timed explosions, kissing a life (and some self-esteem) goodbye in the process. If you end up caught in a rogue bomb�s bounce, remember that it doesn�t explode immediately, so stay focused and step lively: jump out of that whirling death trap before the fireworks start! Saboten doesn�t let you jump down through platforms, unfortunately, but it compensates for this omission with a very different and nearly-unprecedented player advantage � if you touch an enemy, you aren�t hurt at all. In fact, by walking straight into adversaries you can shove them around, or even jump onto their heads to stun them for a moment or two. So, if they can�t hurt you, what can? You might have already guessed � all enemies possess their own stockpiles of pyrotechnic destruction, and THOSE are what�ll get ya. Also beware that you can be pushed and dazed just like they can, so if one baddie bops you on the noggin while another is readying a bomb, you�ve got a problem. Finally, unlike in most of this game�s relatives, new enemies sometimes appear mid-level, so never assume that you can cruise the rest of the way just because you�ve blasted away a few pests. On occasion, aside from a boss or two lying in wait, you�ll stumble into an unusual bonus level where you try to lambaste the second player (or an AI stand-in) for some extra points. Why Should I Play It? � When you first start messing around with Saboten, things will probably appear utterly chaotic: a seemingly random mess of bombs, critters and heaven knows what else bounding all over the darn place, far too frantically to keep up with. That is, it might seem that way if you try to play it like a �standard� action-puzzler � if you instinctively start spamming the �attack� button the second an enemy is in front of you, things get ugly real quick. Handling this cactus without getting poked requires players to carefully and deliberately utilize the tools at their disposal to bring forth order � is an enemy hanging around in a tight spot where throwing a bomb will lead to a dangerous ricochet? Move on in and push him out of there! Need to keep your distance from a dangerous foe? Launch safe, targeted attacks from afar and keep moving so he can�t get a bead on you. Got the munchies for items and points? Herd a bunch of baddies together, stun any pesky stragglers to make them stay put, then quickly finish �em all in one fell swoop! 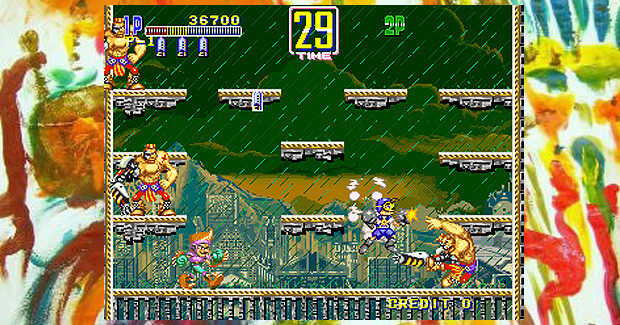 Don�t spend too long setting up, though, as each level has a rather stingy time limit: nasty hazards from above will begin to drop, Smash Bros. style, if you let it expire. Getting used to Saboten Bombers� unique way of doing things isn�t as hard as is might sound, and the fact that the game provides some nice scenery along the way certainly doesn�t hurt � while the title screen and inter-stage displays are jarringly plain, everything else has been rendered with loving, pixel-by-pixel care. Backgrounds, while mostly static, are varied and attractive, but the real stars are the weird and wonderful character sprites � I don�t know what happened at some poor sucker�s house to make all these mutant vegetables and whatnot start running around, but considering how finely detailed and smoothly animated they all are, it�s tempting to just sit back and watch for awhile. More than that, each critter�s smallest action is positively stuffed with quirky personality � the clumsy star-shaped grunts squat and strain mightily before finally popping out a bomb, while the flat, lumpy blue things might plop down and light up a tiny cigarette if nothing�s happening at the moment (not sure how they smoke �em since they don�t have faces, but hey, it�s a tough habit to break). While Saboten�s soundtrack certainly meets the genre�s recommended allowance of synthy pep, several tracks are buttered over with mellow, moody interludes, which inject a surreal, dreamlike air�if nothing else, this certainly fits the bill when you�re taking on the persona of bomb-toting desert flora. Where Can I Find It? � Here we go again � Saboten Bombers remains a seldom-spotted arcade exclusive to this day, so either start PCB-huntin� or start emulatin�. Or die tryin� (well, maybe not quite that far). There�s also a bootleg version out there known simply as Cactus, proving, if nothing else, that the dire lack of nominal creativity among pirates is hardly a new phenomenon. Anything Else? � In case you need me to say it out loud, no game plays quite like Saboten, but if you�re up for other puzzle-platformers with a �bomb� theme there are a handful of options available. The closest cousin to our present subject is probably Penguin Bros., which gives Saboten a good run (well, at least a steady jog) for its money in the �who thinks up this stuff?� department. Dynamite Bomber is another interesting choice, though its pacing may be too slow for most � when you use a bomb it�s placed right where you�re standing, and a separate �fling� button is needed to throw it elsewhere. 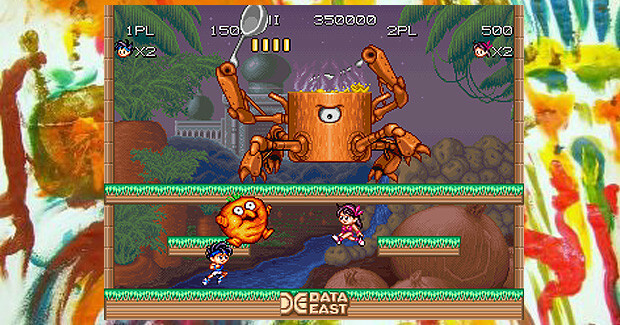 Out on a limb is Zupapa, in which you toss little mini-versions of yourself at enemies to set off starry �explosions� capable of taking down nearby groups � of course, since your �ammo� wanders around on its own, you have to chase it down first. Yoyo�s Puzzle Park (aka Zoku Gussun Oyoyo) and anime-based doujin release Nurse Witch Komugi Show offer similar gimmicks. What Is It? � Mitchell is a veteran developer which has never really gotten its due � on the puzzle front in particular, credit for their Pang (aka Buster Bros.) series has largely been usurped by publisher Capcom over the years, though the straight-up theft of the PuzzLoop formula by a number of wannabes (the best-known being PopCap�s Zuma) is even more deflating. More recent efforts like Polarium and Number Battle have kept the company afloat, but Mitchell has yet to fully reap the fruits of a big hit. Perhaps their least-appreciated minor masterpiece of all, however, is this suitably �funky� 1992 release. How Does It Work? � In its quest for uniqueness, Funky Jet almost disqualifies itself outright from consideration as a �puzzle� game, tilting unequivocally towards the �action� end of the scale - thankfully, its creators thought things through beforehand, and know exactly why this shift had to happen. While a depressingly small number of noteworthy exceptions manage to shake off their subgenre�s penchant for stiff controls and limited mobility, for some players this still isn�t enough freedom to make playing worth their while: if you happen to be in this camp, your knight in shining armor has arrived. And he�s sporting a jetpack. The greatest platforming enemy of all � gravity � has finally been conquered. No more sluggish shuffling or stilted jumping (or any jumping at all) for you - want to get somewhere on the screen? Just tilt the joystick towards it and off you go, no muss, no fuss. Sit still in midair for a moment or two and you�ll slowly descend, but otherwise feel free to zoom about at will � any and all destinations are open to you on a moment�s notice. Some of your enemies can fly too, but most (including obstacles and hazards like bombs and falling crates) are confined to terra firma, leaving you free to approach them from just about any angle, though they�ll put up a good fight once you�re in close enough. That said, beating up this plethora of punks is a relatively simple affair. The �A� button throws straight punches: once you land a blow that finishes off a bad guy he�ll go flying straight back until he hits a wall and plummets off the screen for good. If a freshly-punched hooligan smacks into any of his companions along the way they�ll all go together, leaving a handful of power-ups in their wake: your most common rewards are canisters, which are combined into a temporary-invincibility item once you�ve collected a set of five. There are also occasional Speed-Ups, Power-Ups, and a rare Stopwatch which will temporarily freeze all enemies onscreen, but the only other items you�ll see regularly are hearts to refill your health meter � wait, what? You mean that one hit doesn�t kill you instantly in this game? Nope � you�re able to absorb a couple of boo-boos before kicking the bucket, and can repair some of the sustained damage to boot. 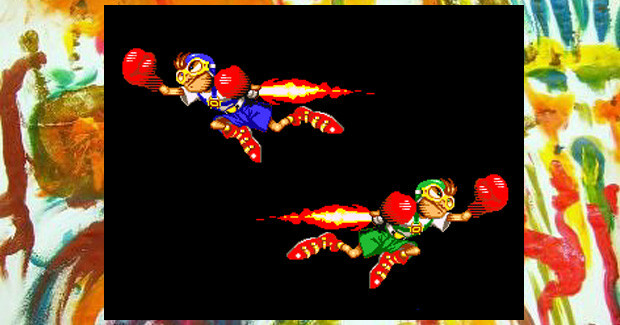 As a trade-off you only get two lives, and a single enemy hit will cancel out most any enhancements you�ve picked up. To make putting together a new reward-laden row of baddies a bit easier, you can hit the �B� button to throw a spinning punch � this will damage enemies to either side, and more importantly knock them around to your back if they�re in front of you, and vice-versa. With a little creativity you can use this technique to bring stragglers down from upper platforms and line everyone up for a single, swift takedown � easier said than done, of course, when everyone�s highly intent on jacking you up, not to mention the ever-present clock ticking away. Why Should I Play It? � The biggest single reason to try Funky Jet, obviously, is that wonderful jetpack � after being nickel-and-dimed ad nauseam via frustrating, clumsy deaths in countless puzzle-platformers, it�s a great feeling to just be able to go wherever the heck you want, whenever the heck you want to, without having to struggle with wonky movement mechanics. This nifty accessory might be offset a bit by the dorky goggles and boxing gloves which comprise the rest of your repertoire, but when juxtaposed with the wacky villains populating each level they don�t look too out of place � of course, no matter how shameful your wardrobe, it always warms the heart to hear the scratchy �owf-owf-owf-AAAAHHH!� of a successful beatdown. Things may seem easy at the start, but a few levels in you�ll almost certainly be singing a different tune � that same screen which once seemed so spacious and free will be stuffed to the gills with dudes gunning for you, and you�ll need to summon forth all of your twitch skills to jet through the hostile mob in one piece, especially once some of the bigger guys who don�t die so easily start showing up. More of a beat-�em-up hybrid than a platforming offshoot, Funky is a very straightforward game compared to most of �Magnet School�s attractions, but it�s still great fun, especially when you wouldn�t mind a break from some of the more brain-busting titles on here. �third alto in the second row, you�re flat. Anything Else? � The best alternative I know of to Funky Jet�s genre-defying freedom of movement is unsurprisingly a homebrew creation, Inyou Douji Monogatari, which allows players to fly around at will in somewhat similar fashion, though its levels tend to be more confining. One �official� release which taps into this same spirit is actually an earlier and much more �traditional� title called Rod-Land. You get around mainly by climbing ladders, as your character isn�t even able to jump - the cool part is that you can create a ladder out of thin air, ascending or descending, pretty much any time you want, though only one �insta-ladder� can exist at a time. You can use this ability not only to traverse the landscape but to mislead and trap enemies, whom you actually want to leave alive (if possible) until you can activate a temporary �Extra� mode, during which they�ll start coughing up extra lives. If you�d like to experience another unique Mitchell puzzler which has passed WAY below most gamers� radar, Ko no e Tako is as fitting a candidate as you�re likely to find: its official page is here. �and with that, I finally lay down my chalk, for good this time. At this point you have experienced pretty much every worthwhile thing I know about obscure puzzle games: I declare your �formal� lessons for this curriculum to be over. That said, you and I are not quite finished with each other yet � after all, what�s an education without a little pomp and circumstance to top it off? Next week I will be delivering your graduation speech: I do hope you�ll stop by, as I intend to leave you with a few final things to think about before taking my leave. That�s all � for the final time, class is dismissed.